This past weekend I had the pleasure to attend the Theorizing the Web 2013 Conference that was held here in New York City at the CUNY Graduate Center. I attended the 2012 conference from a distance last year, and was thrilled to have the opportunity to meet some of the presenters, participants, and organizers in person this time. The program was filled both with speakers of note and those not yet widely known, and being around such positive energy of people doing, discussing, and debating theory on the phenomenon known as the Web provided for an engaging experience. In fact, I realize that I have not been challenged to follow along with and discuss some of these issues in a very long time, if at all. While I love discussing theory and how it applies to practice, it is not very often that I can spend some time discussing this in such an intensive way. I had a conference high that is still swirling around in my mind, and only wish I had enough time to read all the articles and books that were mentioned and about which I know little. The main theme for this conference seemed to be surveillance, related to law enforcement / government as well as to corporate interest and influence in what, how, and when I see things online. Closely linked with this is the persistent topic of free speech and what this freedom means in theory as well as in practice online. All of the presenters, organizers, participants, and hash tag moderators (me!) are on the Participants page. From David Lyon to Alice Marwick to Stéphane Vial to danah boyd and beyond, I have a lot of people’s’ works on my next-to-read list. The CUNY Graduate Center space was a great conference venue, with powerful and fast wifi throughout. Furthermore, its new JustPublics@365 project has many promising communication initiatives to come! As I work so close to the Grad Center, I am hoping they continue to have events open and welcoming to the public. Now, to be fair, I don’t want to make it seem this conference was perfect or the single best thing since pizza and red wine. There are always a few minor wrinkles or distractors (there was not any coffee or food of any sort on Saturday, we had to vacate the building just before its closing at 6:00 on Saturday that resulted in our not having an opportunity to thank the organizers or otherwise establish a sense of closure, there was an issue with the gender neutral bathrooms (that did not have a bath in them, BTW!) and privacy within them, and there was not sufficient time in the presenter sessions to ask and discuss anywhere near as many questions as were conveyed in the room and via the specific Twitter room hash tags). While these various things can be a bit distracting at the time, in the larger scheme of things they are all minor (except the questions and discussions after the speaker presentations!) and are listed here more as a memory of what happens when a few dedicated volunteers put on a free conference; there are bound to be a few minors issues. However, all things being equal, there is really nothing to complain about — kudos to Nathan, PJ, Jessie, and the entire planning committee! Given all this, what are my own next steps? Read. I gathered a number of articles and books that I already ordered and downloaded in the specific areas of surveillance, Twitter (an ongoing area of personal /professional / academic interest), and the notion of our cyborg identity (with a bit more of a journey into actor-network theory). Engage. I met a number of really interesting, very smart, and highly creative academics and theorists at this conference, and I have to make a conscious effort to maintain some of those connections (even if that means I need to move past my near-infatuation with Twitter). Contribute. What good is all this reading and engaging with others and their ideas if I do not integrate them into my own thinking, perspectives, research, and theorizing. There is no reason why I cannot pursue some of this on my own, especially as I am nearing completion of my PhD studies. Furthermore, I am glad I was able to act in the role of a hashtag moderator, though I think I want to become a little more involved in some way. We’ll see what that may mean (perhaps even based on my 2 previous next steps! ); surely in some interesting way! I look forward to seeing some of the archived sessions once they are online and available, as well as some of the online photos. Until then, onward and upward as we continue to theorize the web and what that means in our lives. As some of the emphasis in the #nlc2012 overlaps that of the #change11 MOOC, I am looking forward to seeing how they complement one another and help me to move my research along. I hope to see some of my colleagues there! 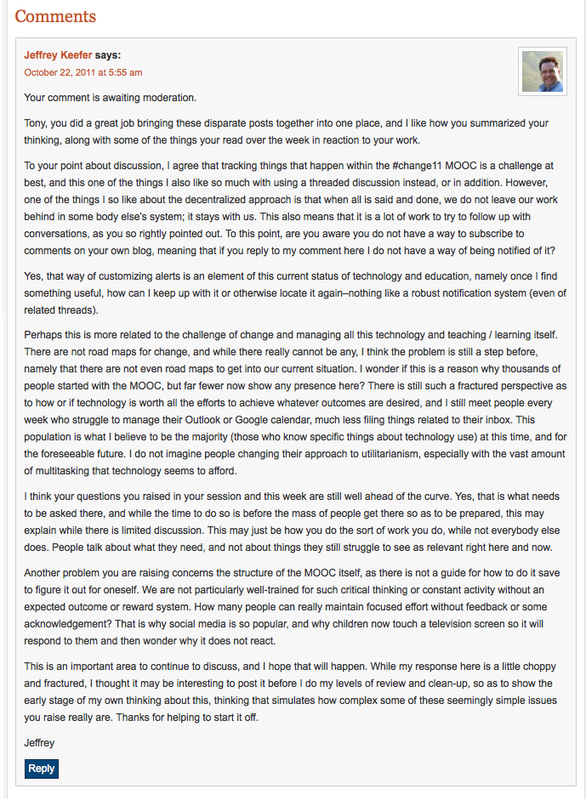 Tony Bates spoke about his work this week in the #change11 MOOC, and summarized some of the comments and replies he received and / or was able to track through the Daily Newsletter for the MOOC. His summary was quite interesting and very well thought out and developed; wish I could write that clearly! I decided to reply to it in a somewhat long, winding post, writing in a narrative that captured my thoughts as I had them. I decided that it may be more in the spirit of the topic to not overly refine, so that is what I did. I wanted to point to my response, but since it is not present / yet approved on the site (somewhat interesting, given the calls for reform and expression, though I can imagine that spam may be an issue, especially for somebody with Tony’s reputation and work), I thought I would take a Snag of it and share here, and not just copy and paste it. Now, along the same point I made in my last post, I wonder to what extent an ongoing discussion of this will occur. This week’s #change11 MOOC features Tony Bates, who started the session off with a rare Sunday synchronous session on the topic of Managing technology to transform teaching, based on his book Managing Technology in Higher Education: Strategies for Transforming Teaching and Learning. I enjoyed the live session of this, even though I missed the first half of it due to login issues with the required Java environment that was not included in my copy of Mac Lion. While I did not feel I have much to talk about in this area (quite interesting, but somehow I need more prompts), I visited Tony’s website for the book (as he suggested in his week’s intro) and then I saw it–he invited us to discuss the topic on his book’s built-in forum. The site is rather flashy, nicely built and designed (publishers do nice work to help promote and publicize books, as well as savvy authors who want to get their message out), and sure enough, there were loads of discussion questions, 34 of them to be precise. What I found most interesting is that, at the time of this post here, there were only 2 replies. Yes, that’s it–2. Thinking about all the time and energy it took to install and design and organize the forum, as well as the resources spent on identifying those 34 questions, done 4-7 months ago(once again, at the time of this post), there were only 2 replies. 34 questions, 4-7 months old, and 2 replies. I won’t even begin counting the nested Scenarios in the Forums (on the bottom of the same page). The question I have, is why? Why so little discussion on something seemingly so valuable? Even after talking about this on the live #change11 session (with thousands of people registered and others informally participating), with the promotion the authors are surely doing, and even with those finding this through other means, why so little discussion? I find the topic interesting. The authors are engaging. What I have read about the text is lively, valuable, and forward-thinking. I have had some relationship with higher education for years. I like technology in HE. I even like to read and discuss all of this, so I know I am not alone. The question is still why? Do people not want to talk about this? 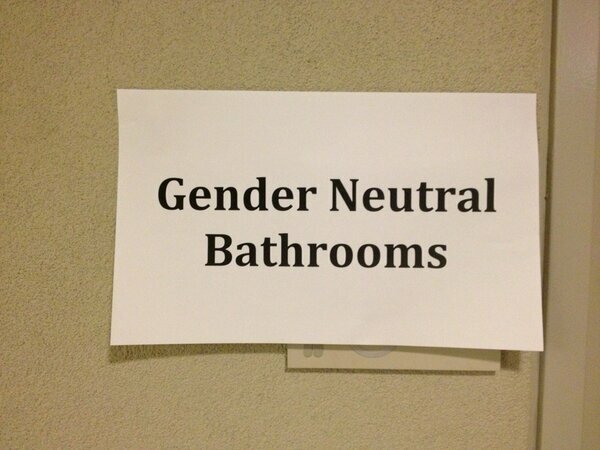 Perhaps they think it may not affect change? Perhaps people are overworked and it is a time issue? Perhaps people are reacting to it in their own way (as I am with this blog post)? I am not sure, but I think that it may be useful to consider this, as the implications for a world ever more in need of getting the changes needed to this higher education behemoth right is beyond compare with many social issues. With so much to discuss and explore and develop, why so little discussion about it (at least here)? I really like how Allison Littlejohn began her Week 4 #change11 MOOC week on Collective Learning. I especially like how we are having 2 live calls this week to discuss all of this, and she gave us a task to help get us started in her Task 1 introductory blog post. In some ways her extremely clean organization is a welcome change from the diverse (isolated?) ways of learning and communicating in a MOOC, though in other ways it is task-oriented in a way that may potentially be at odds with the personalized objectives and freedom to set (or not) learning goals. Then again, as all the tasks and things to focus upon in this open course, I believe the tasks help to focus those of us who need help focusing on something, especially if we want to engage with Allison as this week’s speaker. In reading Allison’s Position Paper, I was struck by her her “grand challenge,” namely for people to have to learn differently. I did not see the evidence in the initial paragraph, in that technology requires a demand for new knowledge. I am not sure if technology in itself demands new knowledge, or even that any societal development or global issues, such as energy consumption or healthcare needs, requires ongoing knowledge creation on a large scale. This does not necessarily involve an increase in technology or expansive knowledge on behalf of a growing population per se. Whether solar cells or wind technologies expand, I as a consumer do not need to know the particulars–I just need to buy the product and leave the rest to the scientists. Do I really have to learn differently, or is it more that I find learning by navigating the collective helps me expand in ways beyond my own cognitive, affective, psychomotor, reflective, collaborative learning processes? However, I do think that with the increases in social media and the opportunities for new forms of research that may be possible as a result (cf. my doctoral research, considerations of networked learning, or even considerations for digital scholarship), reframing how we see learning that involves a collective (involving the intersection of the learner and the larger group) does have merit. Participating in this MOOC itself allows for a flexibility in how and what we learn in ways that potentially connects us, and while it is not possible to follow all elements of this learning (cf. How to Participate in this MOOC), I do think that better understanding how people navigate and make sense of this process is a rich area for study. Who hasn’t heard of Generic Viagra? I think such people don’t exist. But as it turns out, this drug has another effect (apart from giving a “superpower” to our men). I’ve just found it out. My friend’s aunt got really sick. I do wonder, as we are invited to do in Task 1, to what extent this collective learning (to sole real-world problems) can be organized. How can creativity and idea development leveraged from the collective be organized in a way to solve problems? Wouldn’t the problem-solving techniques establish objectives that would begin to funnel learning into how we currently solve problems, namely through brainstorming, writing, discussing, and the like? Perhaps my meandering question here is really about the Task itself — is there such as thing as collective learning, or is it really individual learning via the collective?